Don't miss this special Restorative/Deep Stretch class set to the beautiful vibrations of the cello. 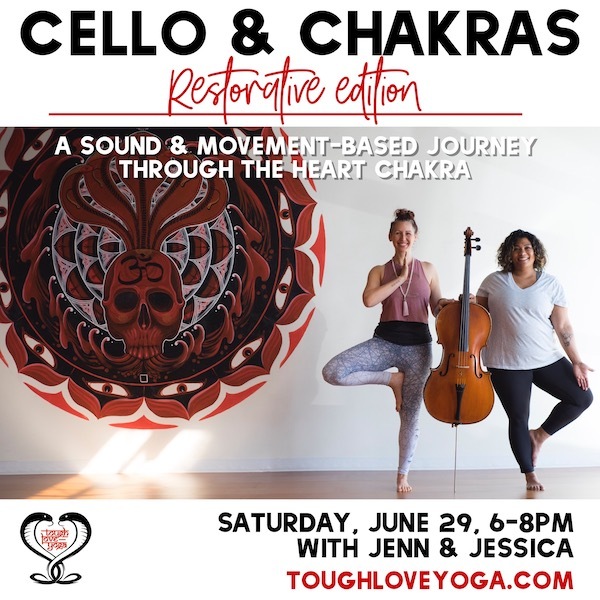 Join cellist Jessica Messere and TLY teacher Jenn Cook for a musically-led journey through the seven main chakras -- subtle energy centers in the body where major nerve centers and organs gather, as well as psychological, emotional and spiritual states of awareness, using restorative poses and gentle stretches. Jessica will play live, creating a melody based on the note associated with each chakra as Jenn leads you along these energetic fields through this restful, mindful yoga practice. Afterward, enjoy the community and company of your fellow yogis. Please e-mail info@toughloveyoga.com with any questions.